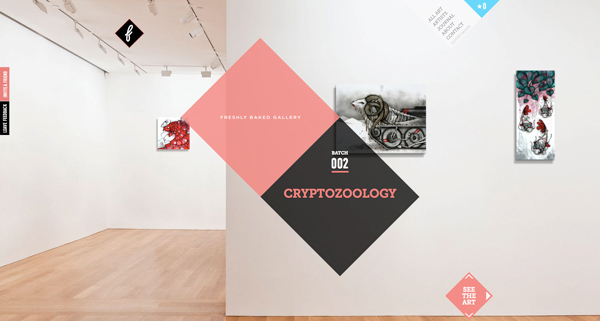 Just in time for the apocalypse, Freshly Baked Gallery, the brand new online art space has launched their next batch – a collection of my works, ‘Cryptozoology’. Take a walk on the wild side with this Freshly Baked batch of beautiful beasts from the mind of Kaitlin Beckett. While only mothers could love ‘em, they’re exquisite to view – the artist rendering each creation in meticulous detail with ink, acrylic, chalk pastel and crayon. Striking black and white canvases are ripped through with vibrant colours. Beckett’s work has been shown internationally in Australia, New Zealand, UK and USA; most notably at Miami’s Art Basel and Melbourne’s own National Gallery of Victoria. Coming soon to a screen near you, be sure not to miss these whimsically dark and benevolent critters before they crawl, fly or swim back to where they came from! View the website at http://www.freshlybakedgallery.com from December 21, 2012.